We are the well-known organization actively engaged in offering a wide assortment of Stainless Steel Cocktail Shaker. Our workforce designed this cocktail shaker as per the market trends utilizing quality approved material & modern techniques. 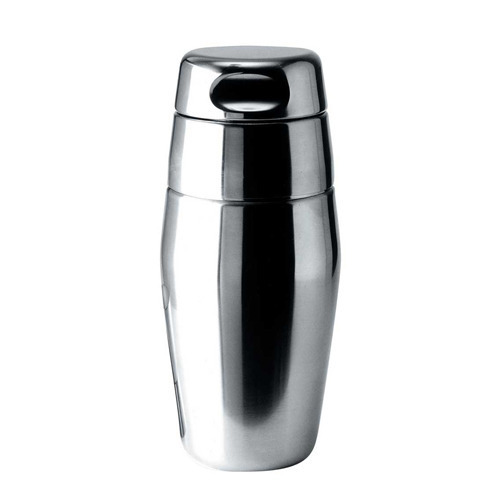 We offer this cocktail shaker in various specifications in order to meet various requirements of clients in a proper manner. Customers can avail this cocktail shaker at reasonable rates in a stipulated time frame. Code Capa-City Qt Size Dia/Ht Cms Packing Pcs REF.W Gms. Since our inception in the year 2006, we Bhagirathi Exports Private Limited has attained a distinct place for us in the market domain of manufacturing, supplying and wholesaling a wide range of Stainless Barware & Kitchenware Accessories. The offered range can be easily purchased from us at the most economical price. We are offering these products in various stipulations to choose from. In our offered range we have Barware Accessories, Stainless Steel Barware Bucket & Kitchen Ware. These products are made by utilizing high grade stainless steel under the direction of our domain experts as per the set quality parameters. We have hired skilled workers and domain professionals to manufacture the offered range of products. Only optimum quality basic material has been incorporated in the manufacturing of the provided range. Basic materials for the offered products are given by the trustworthy vendors of the market. Also we are backed by a well equipped and modern infrastructure unit. We have installed all the required machines and tools in our facility to make the offered range industry approved. Moreover, to deliver our products safely and timely at client premises, we have developed a wide distribution network.